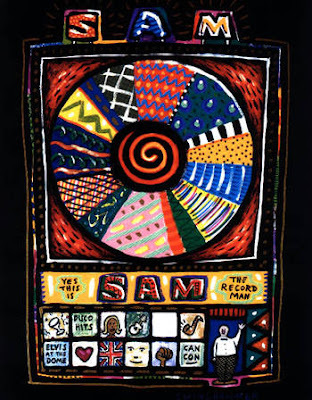 When I noted that Sam The Record Man is about to close shop, I mentioned several artists who benefited directly from Sam's existence and mode of being including Kurt Swinghammer. After receiving a couple of "who he?" e-mails, I thought it behooved me to forward one and all to his website. I am perhaps inordinately fond of Kurt. I used to follow him back when he and Ron Sexsmith were running an even keel, showbiz-wise. They'd put on shows at C'est What? and joke that the plus to performing together was being able to call themselves SexHammer. Kurt seems to have slowed down a bit in the aural arts department, while picking up the pace as a visual artist. He is a delightful wielder of the air- and paint-brush, but for those of us who have seen him playing guitar and singing on stage, it's a bitter pill to watch him step back, however temporarily, from the scene. Anyone who had a campfire facility with the guitar knew this guy was freaky magic, but for some reason that never seemed to translate in the studio (the way it does for, say, Richard Thompson). Using the Tricky Pix for Klutzes book, "you can learn how to create your own Page-1 worthy beast!" Well, Anaheim is clearly a defenceman's team. Last night's event skated perilously close to the sort of game I don't enjoy watching, where the play is almost entirely dictated by a suffocating defense. Every time Alfredsson, Heatley and Spezza attempted to assemble their rush, they found three Ducks waiting for them across the blue-line. The Senators spent three periods beating their heads against the wall, then scratching their heads trying to figure out how two Ducks could outplay the two Senators on defense. If Sens goalie Ray Emery weren't on fire, the Senators would have been taken to the cleaners. Neidermeyer was spectacular to watch, and there were moments in the second and third period where you could see the Senators trying to tease apart the Anaheim defense. Too little, too late. I'll be curious to see what sort of strategic changes coach Bryan Murray makes. For the regular season he and the Senators have been capable of readjusting their play with breathtaking results. My hunch, and here I must resort to the precise language of acute analysis, is something will "click" for the Sens and they'll win three straight games. But will it be the next three? "I said it, I did it!" And now Sam is closing shop. When I worked downtown I made it a weekly habit to visit Sam's to see what was new in music. Sam's was one of those very old, labrynthine buildings that you could spend days exploring. I don't think they ever sent anything back to the distributors, because I picked up some mighty obscure discs that had been out of print for years. These days I download via eMusic and (very rarely) that would-be monopolizer of all things digital. In some ways the download is a boon for music lovers: I'm listening to all sorts of stuff I would never have bothered with if it had meant buying something wrapped in plastic. Recent download treats include wax.on wax.off, Camera Obscura and Mavis Staples. Just to drive the point home, I've even given Arcade Fire my attention, a band whose music is not at all to my taste. It's good exposure for the artists, and a worthwhile experience for me. But do I ever miss the package! Heck, I miss the LP! Back in the day I used to pore over every little detail on an album cover, sometimes with a magnifying glass, hoping to further decode the cypher of significance within. Those were the glorious days of rumoured backmasking and other mischief. Every album was like a ticking bomb that you unpacked and explored at your own peril. The world — your world, our world — could change! Well, the world has changed and now it's just the music and nothing else, which I suppose should be more than enough. But some days it seems like little more than a bunch of ones and zeros. 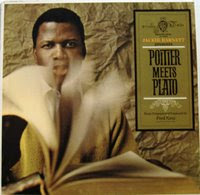 And I miss the event of stepping into a creaky old building that required a person to walk up a set of stairs, then down a few steps, then take a left and another left before you came into a small room that stocked that über Cool Jazz masterpiece, Poitier Meets Plato. It's another era, and I'm not going to stand in its way. But you'd better believe we're already missing the fun and discovery of the era that's rapidly fading. When it came to scoring bicycles, my brother did exceedingly well at police auctions. In the mid-70s, he and my parents came home from a city auction with a white Sekine (rhymes with "Zucchinni") ten-speed. 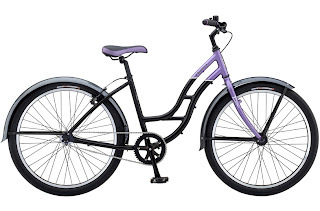 I tried to hide my envy — prior to receiving my CCM five-speed, the cute, dark-haired girl next door had informed me that Sekines were "the best bikes in the world. And they cost a hundred dollars!" (Guess what she got for her birthday?) $100 was an unconscionable amount of money for a Mennonite to spend on a bicycle in 1977, but my parents forked out fifty at the police auction. I affected indifference to my younger brother's good fortune, while the lucky tyke tooled around town on his flashy wheels. A week later, my father took the bike to a local shop for a quick tune-up and was informed that he'd miraculously scored Sekine's top-of-the-line racer: the gearing was more competitive than the store-bought models, and the frame was much, much lighter. 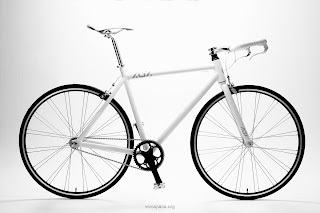 When I finally knew what was what, I had to grudgingly admit my brother's bike was quite the prize: chrome moly double-butted tubing, alloy cotter-less cranks ... the evidence of its superiority to everyone else's bicycle piled higher and higher. Unfortunately for my brother and his snazzy bike, his generation of lads were the genesis of the BMX scene. They didn't want fancy gear-shifting bikes; they wanted a tiny, single-speed bike they could ride off the roof of their father's garage without breaking anything more serious than a collar-bone. Once again my parents took him to the police auction. This time they came back with a monster: a bike that must have weighed 100 pounds, but had a freaky-looking spring that acted as a shock between the rear wheel and the seat post. It was a one-of-a-kind piece of work, and its total cost (including a can of silver Tremclad paint) was $25. By then I had reached that stage of late puberty when all manner of crazy schemes are worth pursuing. A friend wanted to cycle to the West Coast, so I bought the Sekine off my brother. I cleaned it up, put a new seat on it, rebuilt one of the wheels, then promptly lost interest. I must have strapped it to the car the summer my new wife and I took a road trip to meet the family. For the last 13 years I've shlepped it from apartment, to house, to house ... just because I couldn't bring myself to throw it away. Yesterday I inflated the tires (at least 20 years old) and cautiously took it for a spin. It's in surprisingly good shape. Mid-life craziness comes in many forms. Here I am with these two grand, old bicycles, and I'm reading stuff like this, and I'm starting to think I'm not so keen on getting something new as I am on restoring something old ... even if I am all thumbs when it comes to this stuff. It's a curious experience to have my loyalties as a hockey fan so evenly divided. For most of last night's game I did not want Ottawa to win. But then Anaheim got into the habit of taking stupid penalties, and I thought the Senators would trounce them. That's not how it finally played out, of course. The Sens are still getting a sense of their opponents, and if last night's game is indicative, we'll be enjoying a very exciting series for the cup. A couple of weeks back a friend gave me a copy of Monocle, the latest Tyler Brûlé concept to hit the magazine stands. It's a quirky-cool bit of business, and reads a little like National Geographic has been taken over by the über-hip staffers at Wallpaper*. I rather like it, particularly the May issue (still on stands in most North American book stores) which takes a quick look at "global bicycle culture and commerce." I suppose there is utilitarian appeal to a single-gear bicycle (near-zero maintenance). Personally, ever since I received a 5-speed bicycle for my 12th birthday I've seen no reason for looking back. These single-gear bicycles are a novelty that bring to mind a summer moment from the mid-80s. I was sitting in the car with my mother, waiting for my father to finish some banking. There was a bicycle shop next to the bank, and a woman pedaled up to it on a brown bicycle with a milk-basket on the front. Her outfit — cable-knit sweater, long corduroy skirt with woolen knee-high socks — was brown as well. She was smiling primly, and when she lowered the bicycle's kick-stand and entered the store, my mother quietly remarked, "She thinks she looks European." Yes, well: if I thought I looked European, I wouldn't waste money on any of these continental fiddlers. Instead, I'd go straight to the authority — Batuvus — and purchase their no-nonsense Personal Bike Delivery. And I wouldn't mount it unless I was smoking hand-rolled Drum tobacco. In the interests of reportorial fairness, I should mention the Monocle bicycle is a 5-speed. Still, it adheres to the antique fetish aesthetic of the other bikes. In other words, it thinks it looks European. 1977 is also the year I read my first Louis L'Amour novel: The Sackett Brand. It's been 30 years since I read it, and I still recall the narrator announcing at the outset that he liked the feel of socks inside his boots — when he could afford 'em. After that, I was just one more adolescent who'd been roped and hog-tied. Now fess up, pardner: what was yours? The other day I was driving the family car with the windows rolled down, marking out my territory at all the usual family shopping spots and listening to wax.on wax.off at an obnoxious volume. I rolled past a comic book shop I hadn't seen before. Since I was already in a whimsical mood, I parked and paid it a visit. (1) Comic book store clerks come in two models: those who are offended by your pitiful existence, and those who are keen to help you. Very, very keen. I think I prefer the former to the latter. (3) A Lecture on Geek Mythology by wax.on wax.off (eMusic here) is probably this summer's soundtrack. It's infectious, riff-driven loser pop-punk, somewhat akin to early Green Day. My daughters would love it, if I gave them the chance to listen to it. Alas for them, the "offensive lyrics" warning will be taken seriously by me ("Santa Is A Pervert" is a song that fully lives up to its title). With that last caveat, I wholly endorse DarkoV's recommendation. I was going to let the day pass without notice, but I really have no good reason to be coy on this matter. Happy birthday, Star Wars. *sniff* You're 30 years old today, and yet you don't look a day over 12. A little link-love: lots of fan-boys are linking to this piece by James Lileks, and for good reason: he achieves a crucial balance between public embarrassment and private joy that most of us 40-year-old Freaks of the Force are striving for. Yahmdallah has read all six pounds of The Making Of Star Wars, and has left me wishing his scanner was up and running. And the BBC has compiled a list of 30 facts most of us already know about Star Wars. Still, it's good to be reminded that Star Wars was beat out by Annie Hall as the Academy's Best Picture Of 1977. Feh. If you remain unsure as to which is the movie of greater cultural value, I ask you: just how many blogs are devoted to parsing over the dialogue between Woody Allen and Diane Keaton? With Detroit now out of the picture, it's entirely gratifying to anticipate the Stanley Cup fight between Disney and Ottawa. I'll be cheering on the Sens, a team that has experienced its share of management, ownership and Players' Association grief. It could be argued that these trials are just part and parcel with belonging to the league, but anyone who lives near Toronto knows otherwise. If you wear a blue and white jersey, you are blessed with everything except a team that bothers itself with winning games. But who would waste a thought on the Leaves right now, when the league's two best teams are gearing up for a proper showdown? Not I. Speaking of outbursts: here I was, leafing through the latest ish of geez magazine (billed as a publication for "wannabe contemplatives, front-line world-changers and restless cranks." I qualify for two out of three: the last time I was at the front of any line was when I craftily cut in at the premiere of The Return of the Jedi. Oh, but the Lord did mete out a swift and stupendous plague for my young adult skullduggery: Ewoks!! And with them the narrative collapse of Lucas's Campbellian empire. Never, never again. Now I take my rightful place at the back of the line, and I don't complain.) when what do I see, but this — my snark! "[W]e have a very Jewish system of condemning certain acts, and a very Christian one of implying evil intents. The result? A cultural moment of intense anger roiling under ubiquitous false speech." Jay Michaelson, here. H/t to ALD. When people talk of "summer reading," they usually refer to the sort of book that gets left at the cottage or on the airplane. "Lite" reading, in other words: the sort of thing one might feel guilty for enjoying. Robert E. Howard, Ann Rice, Tom Wolfe and Louis L'Amour have ponied up in my stable of summer writers, and it's not unusual for me to devote the season to coping with Neal Stephenson. But this year I'm noticing a trend (if only among me cobbers) toward weightiness. People are reading books they've put off, or held at some remove. To that end, I believe I may just bite the bullet and read Cormac McCarthy's The Road. This is a book I've taken pains to avoid even though I admit to reading and enjoying his Border Trilogy and Blood Meridian. Lest I leave anyone with the impression that I'm just pulling a Franzen, I'll state my reasons outright: reading the selections being quoted by reviewers (here and here) has been enough for me to fight back tears. I'm not sure the three women in this house are up to dealing with a blubbering pater familias, but no matter: I shall soldier on, and so shall they. As soon as I've landed my copy, it will join the others "On The Floor." My blogular thoughts are bound to follow. There was a time when I could be counted on to spend five hours a week at the gym — the "gym" being my garage or the dirt road north of town. I don't have the temperament for a public gym. And now that I'm in my 40s, I no longer have the temperament for five hours of this and that. One middle-aged guy in decent shape performing a 20-year-old fitness routine, while my buddies and I (each of us weighing in at 145 lbs, dripping wet) were doing our utmost to swell up to Franco Columbo proportions. He comes to mind because now I'm a middle-aged guy, sticking to a light weight routine I was taught in high school: five upper-body exercises (curls, reverse curls, upright row, shoulder press, push-ups). Back in the day, the idea was to perform five sets of 12 reps using a light barbell (I don't think I ever did more than 40 lbs) within seven and a half minutes. When I was a 16-year-old lad that wasn't impossible, but at 42 I'm inclined to stretch that to the 20-minute mark. There was a routine for the legs, too. I can't recall it exactly, but it seemed rather Soviet in design — lots of jumping and hopping on one leg. Rather than tempt cardiovascular seizure, I'll finish the work-out with a brisk walk. The idea isn't so much to build a bod for the beach as it is to keep limber enough so that a day of raking the lawn doesn't cripple me for the next two weeks, while adhering to a regime that doesn't take up more than two hours a week. Of course, any fitness expert could take one look at my routine and point out a dozen blind spots. I could point out a few, myself: there's not much there for the back, for instance. I tried doing some chin-ups the other day, and quickly realized my arms were up to the task, but the back-end of my shoulders (the "lats") were not. But it's a flexible platform. A few tweaks to it, and I'm sure I'll be doing what this guy does before the summer is over. Or not. Ottawa 1, Buffalo 0. What a crappy game! Someone in the Sabres must have entered the dressing room while talking about his favourite golf course. Goalie Ryan Miller was the only one who showed up to play. I still want Ottawa to win but, geez, not like this! Since I'm already on the subject of Detroit, I'll just mention how much fun I've been having catching up with one of the city's favorite, um, sons: Alice Cooper. I know what I've said about geezer rock and geezer concerts, but for Coop I'd make the exception. He's always known how to put on a good show, and if his latest albums are any indication his ascent as Shock Rock's Elder Statesman does not bespeak an inability to entertain. 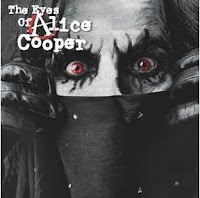 I've been giving his last three albums — Dragontown, The Eyes of Alice Cooper, Dirty Diamonds — more than their due of airplay. They represent an interesting musical transformation. Dragontown is a concept album decked out in contempo-gothic trappings, an attempt by Alice to prove his currency among rabble-rousers like Marilyn Manson and Rob Zombie. It's likeable enough, in its Hieronymous - Bosch - does - a - comic - book way; Cooper evokes both chills and chuckles with his portraits of damned souls (I particularly enjoy "It's Much Too Late," the lament of a pious doofus who can't figure out which god he's managed to offend). I like Eyes better, 'cos Cooper steps away from the kids in the sandbox and reasserts himself as a rowdy old man of rock and roll. He glories in trailer trash grandiosity ("What Do You Want From Me? ", "Backyard Brawl"), acknowledges his age ("Between High School & Old School") then bangs the drum in praise of his pedigree (tearing up the stage with Ziggy and Iggy and the MC5, in "Detroit City"). Not all of the songs have traction, but the ones that do (particularly the three mentioned) really tear up the turf. At this point I should admit I wouldn't have bothered with Coop at all if he hadn't posted these albums on eMusic, a subscription site that offers terrific value for your money — so long as you know what you're looking for. I found myself at the end of a month, staring at unused credits and unsure of what to try next. I downloaded Eyes, then liked it so much I went with the other two as well. Of the bunch, Dirty Diamonds is the stand-out winner. Cooper struts from one tawdry platform to the next with absolute confidence, bringing his losers and goons to life and garnishing them with flourishes of wit that generate smiles without the burden of too much self-consciousness. In other words, it's a hoot: rev-engine rock & roll that allows the listener to forget his age for a few minutes as he squeezes out the last rep in the gym, or jumps around the living room with his daughters. Yes, Detroit doesn't just outperform Toronto at hockey, it does so musically as well (with, perhaps, the sole exception of Rush). I once sat next to Randy Carlyle on a flight from Toronto to Winnipeg. This was back when he was defence man for the Jets. He was a friendly guy, a bulldog on the ice, but an intelligent player, too, and now that he's a coach, I'm prone to cheer for his team — even if it is the Disney Ducks of Anaheim. On the other side of the rink is Detroit. It's difficult for me to muster much enthusiasm for any team that has established a Stanley Cup "legacy" within my living memory, but occasionally I make an exception for Detroit. Detroit exists as a loud red rebuke to Toronto's inability to produce a hockey team that matters. Toronto — the city that once proclaimed itself "World Class." Feh. If you can't produce a sports team capable of world class results, you don't deserve the moniker. Yet here are the Leaves ... sorry: Leafs — with the NHL's most reliable fan base, generating far and away the league's largest income from ticket sales and merchandising, and they can't even make the play-offs. 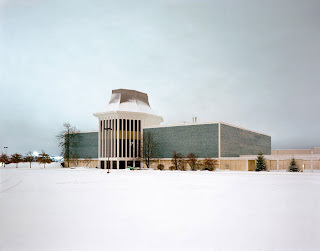 Toronto is a "nice" city — unlike Detroit which has never held any "world class" pretensions. Half of Detroit looks like a war zone, the other half looks like it wants to pick up and move somewhere nice. Class, race, architecture ... in the arts and entertainment and on any level you'd care to name, Detroit is a city that fights with itself. I don't know how such a scrappy city can produce a hockey team that's been equal parts muscle and elegance. By rights, Detroit, not Philadelphia ("City of Brotherly Love" — ha! ), should have been the natural home of the Broad Street Bullies. On this side of the border Toronto lovingly feathers a nest for its brood of pampered hockey duds while the rest of the league fights to stay alive. Where was I? Oh yeah: not sure who to cheer for, 'cos I love 'em both. Local Leafs fans are backing Buffalo, a team I'll cheer for only when they're playing against Toronto. So I'm quietly hoping to see Ottawa square off against Anaheim ... and bring home the Stanley Cup. There are (at least) two approaches to watching one's 10-year-old daughter perform a lead role in the grade school musical: (1) at the edge of one's seat, a bundle of tension and nerves, consciously willing oneself to take another breath in ... and out ... .... wup, better breathe in again ....; (2) immersed in the pleasure of the moment, laughing when it's time to laugh, and applauding when it's time to applaud. My wife embodies one extreme, and I the other. Any guesses as to who fits which profile? 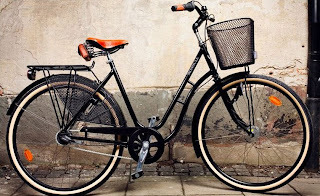 We talked bicycles for a bit, and she said her father once did a value exercise: he figured out how much we paid per pound for bicycle technology, then contrasted that with the per pound price of automobile technology. Strictly on this basis alone, the car is a vastly better value. Here's how this exercise works in my circumstances, in Canadian dollars: the sticker price for a new Toyota Yaris is $14,995. Its curbside weight is roughly 2,080 lbs. That works out to about $7.20 per lb. The sticker price for a new Fisher HKEK is $1,299 (Cdn). Let's say it weighs 50 lbs (bearing in mind it's probably a shade lighter). That's a value of $26 per lb. I have a neighbor who, on any given weekend, can be seen pampering his Cadillac (I'm talking about a car, now). This treatment takes one of two forms: he's either hosing off the dust with his portable pressurized sprayer, or he's following this up with a quick wax-and-buff (using a power buffer, of course). Sometimes his buddy shows up in a vintage El Camino, and they'll smoke cigars and buff the cars. Cut to the present. There's a kid who rides an Orange County Chopper to my daughter's school. I'm talking about a bicycle, now. He wheezed and teetered past me the other day, barely missing my toes with his fat tires. “Cool wheels,” I said. He mumbled thanks, and my older daughter rolled her eyes. “He's such a jerk,” she said. My daughter might be harsh in her assessment (as 10-year-old girls are prone to be), but I'll silently back her up on this. After all, what's this kid done to deserve attention except buy something flashy? In fact, let me just make a blanket generalization. 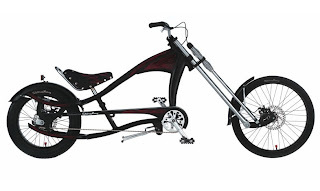 Television shows like Orange County Choppers and West Coast Choppers can be entertaining to watch, but when the final product is a one-of-a-kind bike that Billy Joel is going to park in a garage full of Hogs, I have to wonder: what's the big freakin' deal? What say we devote a show to Billy Joel's landscaper next? Hot Rod Culture. If you can make it, I'm impressed. If all you can do is buy it, well, not so much. I'm in a very tiny minority on this issue. I'd say half my town owns an Orange County T-shirt, and most of these people couldn't be bothered to wash their cars. That's aspirational marketing for you: you can't afford Billy Joel's motorbike, wouldn't care for it if you did, but you wish you could, so you wear the shirt. Or you buy the bicycle. 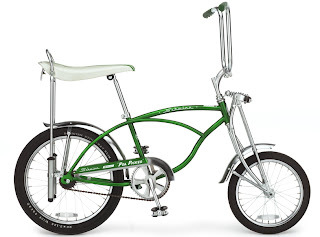 No kidding: Orange County Choppers ”makes” bicycles for adults. I'm with DarkoV on this front: you can't go back. "Rosebud" is a fine thing to meditate on, but there's no point in dropping a bunch of money on what is finally just an accessory to a pleasant memory. Unless you're going to build it yourself — from scratch, of course. 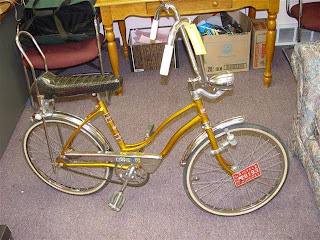 My first bicycle was a golden Garry, with a banana-seat. It was a birthday gift for ... number six? Can't remember. But I do recall watching my father remove the bicycle from the trunk of the family Chevrolet. I've Googled a bit, but this is the only picture I've turned up. It's from an eBay sale, no longer listed. This model is older than the one I had. It's also a "girl's" model, which surely accounts for its excellent condition. And I never had a headlight. But the handlebars ("sissy bars") are similar, as is the seat design (mine was a glittery blue, with white stripes down the sides). Curious to note the Winnipeg license plate on the front wheel. Were Garrys made locally (as in, "Fort Garry")? A few weeks before I received my bike, some neighborhood kids got me pedalling on a small CCM children's bike. The construction of that bicycle, in contrast to the Garry, was closer to what mountain bikes are today -- designed, in other words, to distribute the child's centre of gravity between the pedals, seat and handlebars. A banana seat puts the child's weight squarely on the back wheel, and makes balancing trickier. It was bitter medicine for me to relearn how to ride a bicycle. When my father finally allowed me on the streets, then accompanied me on his bicycle, I shrieked at him to quit swerving toward me. Funny how it's my younger daughter who now shrieks at me. In a comment to the post below, DarkoV recalls the glory days of "riding at a 45 degree angle, on training wheels." Training wheels were never an element in my past, but when it came to my daughters I indulged them. I even attempted actual "training" with said wheels, by elevating their angle. After a few minutes of watching my daughter honing her 45 degree technique, I figured I'd better avoid the chiropracter's bill and get those wheels back on the ground. Fortunately, there's a better way to get kids used to the balance of a bicycle. Lower the seat so their feet can rest securely on the ground, then remove the pedals. The kid pushes the bicycle, like she would a scooter, and very quickly gets a sense of its balance. My girls are cautious by nature, so it took a couple of afternoons of this before they got the hang of it. But I've seen other kids master it within an hour.